UJA Federation of Greater Toronto is delighted to announce the generous gift of $1 million to UJA Federation’s Tomorrow Campaign, made by the Koschitzky Family. 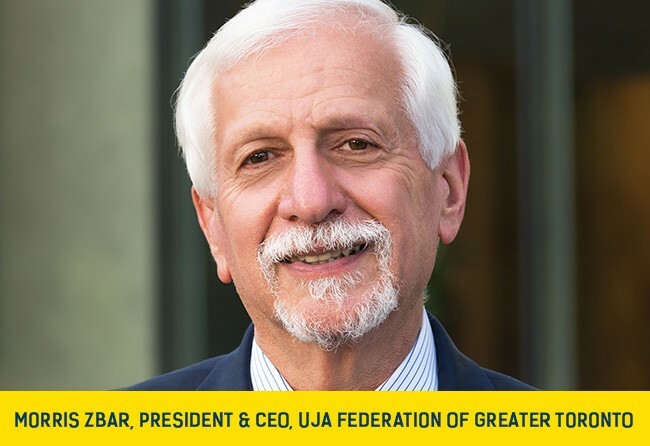 This outstanding gift was made in honour of Morris Zbar, President & CEO of UJA Federation of Greater Toronto, for his outstanding leadership and commitment. The Koschitzky’s contribution will support the campaign to develop Sherman Campus, located on Bathurst St. just north of Sheppard Ave., by naming the Morris Zbar Welcome Entrance – a bright and inviting gateway for visitors to Sherman Campus. “When you enter the Lipa Green Centre through the Morris Zbar Welcome Entrance, you will be entering an environment where each and every professional is an extension of the values that Morris represents, and the standard that he sets” said David Koschitzky.